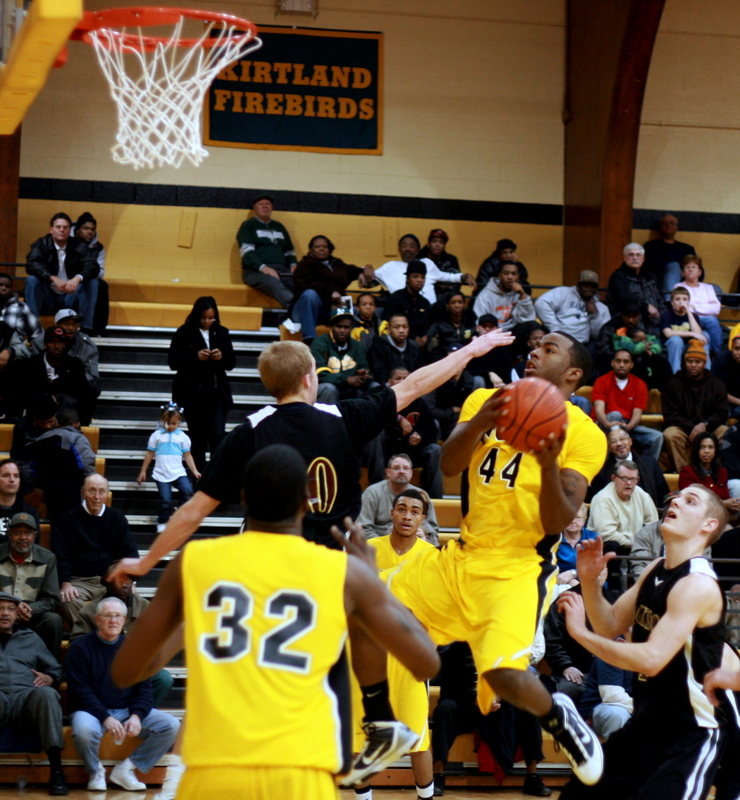 Here’s the video you’ve all been waiting see: Doug Anderson and Torian Oglesby, Mott Community College’s flyboy forwards, making their case to be honorary members of next year’s NBA slam dunk contest. 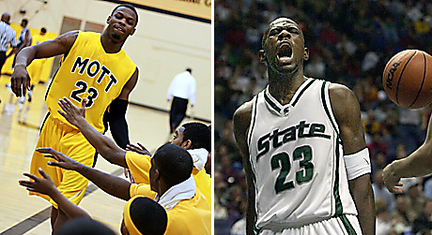 Here’s an interesting read from Hotbed Hoops about the similarities between Mott freshman Doug Anderson and former MSU star Jason Richardson. My take: I watched both of these players in high school and, I must admit, I couldn’t agree more. If I were to compare the two during their early days, I must say that Anderson was a little more physically imposing. In terms of hops, Anderson gets the nod there, too, if only by a little. Where the story is told, however, is in skill. Anderson lacks the skill that Richardson brought to college, as meager as it was, and has a long way to go toward development into an all-around player. He is, however, in the right program if history is any indicator. FLINT, Michigan — It’s becoming clear that if Mott’s flyboy freshman Doug Anderson wasn’t such a phenomenal dunker, he’d probably be known as a pretty good all-around basketball player. Coming into tonight’s 7:30 p.m. matchup at home versus (14-3) St. Clair, Anderson has arguably become Mott’s most valuable player. Lost in the all the hype about his ability to leap like pretty much no one we’ve ever seen are the numbers: Currently, Anderson leads Mott in scoring (14.8 ppg) and steals (2.1 spg) and is third in rebounds (6.1 rpg). 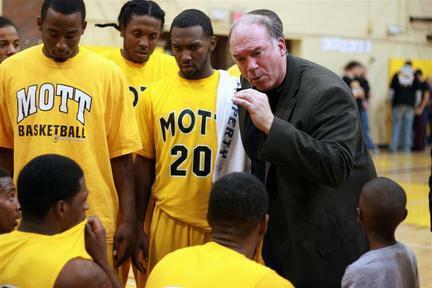 FLINT, Michigan — Most expected Mott Community College, with 11 new players on its roster, to struggle with consistency early on; and, with a few exceptions, they’ve met that expectation so far this season. That being said, the Bears are still 10-2 and appear poised to hit a mid-season stride like so many of Steve Schmidt’s great teams of the recent past. Tonight, the Bears turned in a tremendous all-around effort against Jackson and didn’t look like a team full of newbies. — The best player on the floor tonight was former Flint Central standout Demetrius Miller. He scored 14 points with five rebounds and four assists. More importantly, he played 30 minutes worth of defense on Owens’ best guard. I’m somewhat surprised by the speed of his development into a top-tier point guard. He’s the best point guard Mott has right now. I’m just a reporter, right? What exactly would I know about a storyline? I just assumed that Mott’s loss of Torian Oglesby on Wednesday night to the flu was the big story, the obvious lede to Mott’s stunning 75-70 loss to archrival Lansing on Wednesday night. Doug Anderson and Torian Oglesby (among others), star in this early season Mott Community College highlight video. 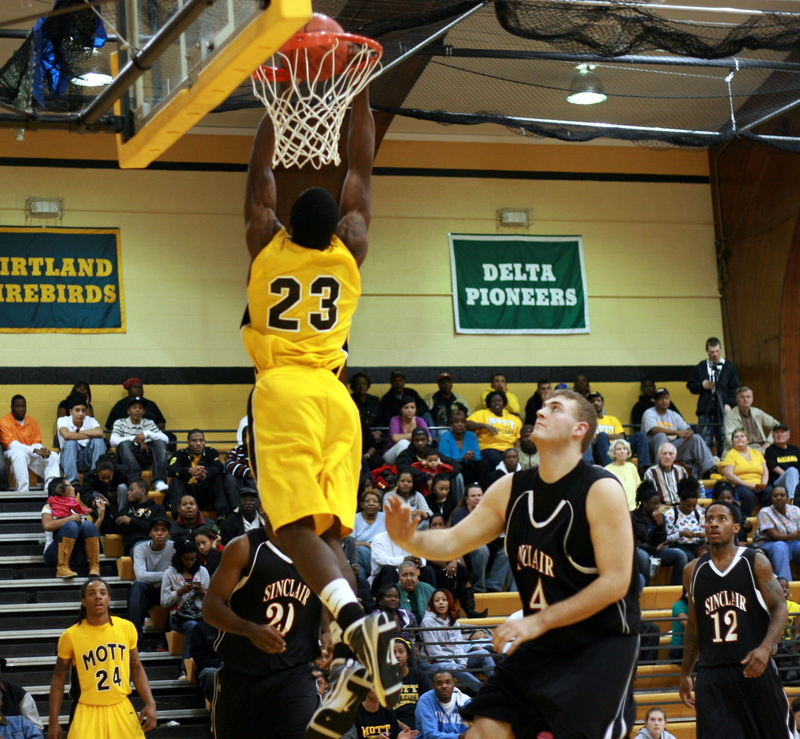 The Bears are currenty 8-1 and sharing the top spot in the MCCAA’s eastern conference with Henry Ford, Detroit. Trevor Cousineau, a 6-5 forward formerly of Davison High School and the University of Arkansas baseball team, has joined Mott’s basketball team. Cousineau, one of the state’s top baseball prospects as a senior at Davison, was a late-round draft pick of the Cleveland Indians and a pitching prospect at Arkansas. He transferred out of Arkansas and enrolled at Mott as he prepares to join the baseball team at Michigan State University next season. Mott Community College’s freshman guard Marshawn Norris returned home to play Jackson Community college last night and brought a few fans with him. Norris had his own cheering section of middle schoolers watching the former all-stater at Napleon and the Bears defeated Jackson 95-55. Steve Finamore, one of the top up-and-coming coaches in the JUCO ranks, is in his third year at Jackson after the school reinstated its basketball program.